Last night the weather forecast was dead right. We had our first thunderstorm with heavy rain. As the tide was low again the dock master took me out in a Boston Whaler to take soundings of the channel. He pointed out a whole island shown on the charts no longer exists as it was washed out in a storm a couple of years ago. No wonder it was confusing trying to find Delegal Marina. We left shortly after and had no trouble this time getting back to the Intracoastal Waterway. 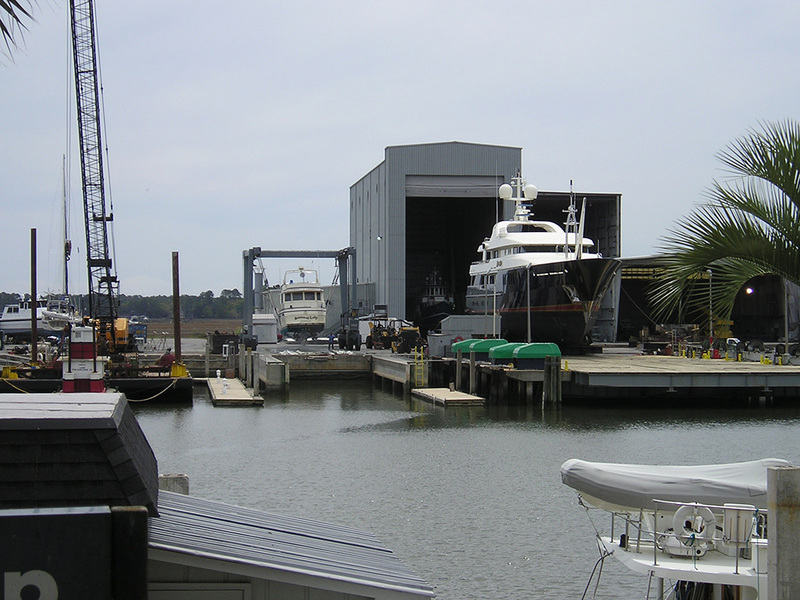 It was only 18 miles to Savannah so after a short run we arrived at Thunderbolt Marina (formerly Palmer Johnson). They no longer build super yachts here but do provide service. There was a huge yacht on the ways. This marina is the closest to downtown and there is public bus service about a mile away. So we rode the bus, had lunch at the Savannah College of Art & Design tea room and wandered about the historic district. Dinner was aboard.